Many Pacific Northwesterners assume that with the cloudy climate, they don’t need to bother with sun protection. Unfortunately, this is not the case. UV radiation is so powerful that 70% to 80% can pass through thin clouds, the type of clouds that tend to fill the sky on overcast days in Seattle. Given this powerful threat, it shouldn’t be surprising to learn that skin cancer is so common in Seattle and the greater state of Washington. The solution, for many individuals, is skin cancer removal performed by a dermatologic surgeon. This is one of Dr. Michalak’s most frequently performed Seattle & Issaquah dermatological procedures. Of the non-melanoma skin cancers, basal cell carcinoma (BCC) is the most common. BCC is a slow growing cancer that develops in the basal cells of the epidermal layer and rarely metastasizes. If neglected, however, it can cause significant destruction and disfigurement to the skin. The next most common non-melanoma skin cancer is squamous cell carcinoma (SCC). Like BCC, SCC is slow-growing. But SCC develops in the squamous cells of the epidermal. Though unlikely, squamous cell carcinomas can metastasize and even cause death. The least common but most dangerous form of skin cancer in is called malignant melanoma or melanoma, both terms meaning the same thing. This form of skin cancer arises from the pigment-producing cells of the skin, the melanocytes, or from a pre-existing mole and can occur on areas of the skin which are never exposed to the sun as well as the more common location of sun exposure sites. Unless treated with care and removed early in its development, this cancer can metastasize, spreading throughout the body. Therefore periodic complete skin examinations by a dermatologist and regular self-examinations of the skin are very important to help identify melanoma early and prevent serious consequences from this cancer. Please go to our section on melanoma for more details and pictures. What Happens During Skin Cancer Treatment in Seattle & Issaquah? In most cases, surgery will be performed on an outpatient basis with local anesthesia. The surgical method used depends on the type of cancer, its location, the degree to which it has spread and its severity, as well as the individual’s medical background. Surgical approaches to skin cancer treatment include curettage, surgical excision, Mohs (micrographic surgery), radiation therapy, or cryotherapy. For small tumors, Cosmetic Surgeon and Dermatology Dr. Michalak may surgically remove the tumor, along with some healthy tissue around it, using techniques such as curettage, surgical excision or cryotherapy. For more advanced cancer, or for recurring cancer, Mohs (micrographic surgery) may be selected so that all of the tissue removed has been methodically examined under a microscope, Taking care to ensure that no cancer remains. Radiation is generally reserved for the most advanced cancer. Aftercare varies according to the treatment used as well as factors specific to the patient, like general health, age, and medical history. Your dermatologic surgeon may also schedule follow-up visits with you so that he can monitor your recovery. To learn more about skin cancer treatment options, contact Cosmetic Surgery & Dermatology of Issaquah. 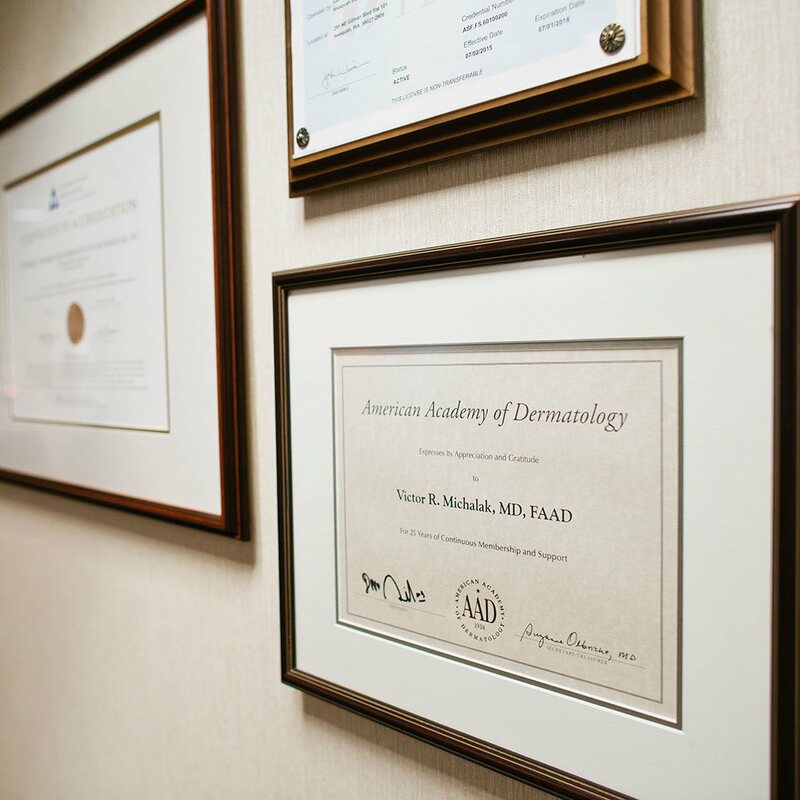 Dr. Michalak is a board certified dermatologic and cosmetic surgeon with more than 20 years of experience in diagnosis, medical treatment and surgical management of skin diseases and skin disorders of the skin. We encourage you to contact our office in Issaquah if you would like to learn more about the types of skin cancer and their treatment or to schedule an appointment with Dr. Michalak. Call 425-391-2500 for more information.